Just for those who may be interested in what is going on at the Manx Island , here is the schedule for the up and coming events. The Isle of Man TT is a two-week festival held on a 37-mile plus race course featuring events on and off the track. With the circuit being on closed public roads the track is open when there is no racing or practices taking place, you can (if you have your bike) do laps of the course but beware traffic will also be on the roads it is not a race track! The mountain section from Ramsey to Douglas is one way but speed limits are in place. Held in the last week of May and the first week of June the Isle of Man TT is split into two weeks the first being known as qualifying or practice week, with daily sessions held in the evening from 6.30pm through to 9 pm where riders can get the bikes up to speed ready for the main race week. During the practice sessions, the riders can choose which bikes they want to get the most laps on so you are guaranteed to see a real mixture of bikes on the track, previous years have seen unofficial lap records being broken. The sessions are held from Saturday to Friday (except Sunday) and feature top riders such as John McGuinness and Guy Martin from the Monday night through to the final night of Friday. Race week is the second week of the festival and see’s races held on Saturday, Monday, Wednesday and Friday of which each race day features different races, the races tend to follow the same pattern year on year with the Superbike races held on Saturday and Friday’s while the Sidecar races are held on Saturday and Wednesday. On the nonrace days during race week, Sunday known as Mad Sunday is a day where the general public do a lap or laps of the course, the roads are not closed so it’s not a racing track but visitors tend to go around the track. Peel day which is a fun day in Peel located on the east of the island also takes place on Sunday. Tuesday of race week see’s the Ramsey Sprint which is a day of sprint races along the promenade in Ramsey, here you can see some wacky and crazy machines! Thursday’s attention turns to Laxey where a bike show is held, you can even show your own bike off! Little and unknown races take place on the Southern 100 circuit in near to Castletown in the south of the island. The Pre-TT Classic races take place the weekend at the start of the main practices while the Post TT Races are run on the Saturday after the Senior TT, another excuse not to leave the island early! We have been made aware that some Isle of Man residents are offering places to stay during the Isle of Man TT and Festival of Motorcycling but are not legally registered. Under Isle of Man law, there is a legal requirement to be registered when offering tourism accommodation. Offering rooms or a property when not being registered can also have a negative impact on the homeowners home insurance. If you would like to check to see if a property is registered please contact us, it takes 2 minutes to check a property. We just need the proprietors name and address. Send us a message on Facebook or call 01624 694456, email homestay@iomttbreaks.com. Regency Travel based in Douglas, Isle of Man is the Isle of Man TT races official Isle of Man TT Travel and Ticketing partner. Located in the middle of Irish sea between the coastlines of England, Scotland, Ireland and Wales, you’ll find our beautiful Island the Isle of Man. Blessed with an extensive coastline, stunning landscapes and unspoilt beaches, the Isle of Man is a perfect holiday destination that’s within easy reach of the rest of the British Isles. On the island and you will find a place full of contrasts and character. Whether you’re looking for an action packed break, relaxing holiday or the perfect family holiday destination. The Isle of Man is just 33 miles in length and 13.5 miles wide with 100 miles of coastline. The Island is famous for it’s annual TT Races, a series of motor-cycle races which attract people from all over the world to the Isle of Man. Douglas is the islands capital and is home to the islands Sea Terminal (where the ferry arrives and departs) and features an extensive array of Bars, Clubs, Casino, Restaurants. During the TT festival Douglas is home to the evening entertainment on Douglas Promenade (Race week only) and is also the location of the TT Village which consists of the courses Start/Finish line, TT Grandstand and TT Paddock. Douglas is 20 miles from the islands airport ‘Ronaldsway’ and is the main hub for the islands transport system. From here you can get a bus to any location on the island, you can also get a Steam Train to the south of the island and also the Electric Tram to Laxey, Ramsey and the Snaefell mountain. Moving further north to the Point of Ayre – the Island’s most northerly tip – you’ll find the Ayres Nature Reserve which is one of the best places to wildlife watch. Visit the Island’s capital of Douglas for a unique blend of traditional seaside resort, thriving finance centre and busy working harbour. Set on the east coast, Douglas is the Isle of Man’s largest town and offers a wide range of things to see and do. Set against a two-mile sweeping bay and sandy beach you’ll find the busy promenades buzzing with activity – why not take a trip along the stretch on the horse trams where you’ll be afforded stunning views out to sea? Or start you journey south by steam railway or north by electric railway. If you are interested in exploring the Island’s heritage, Douglas is a great place to start. The Story of Mann trail, which guides you around some of the most iconic sites, begins at the Manx Museum. A trip to the Great Union Camera Obscura on Douglas Head is also worth a visit. And if it’s motorsport you’ve come for visit the TT Grandstand where you’ll have a bird’s eye view of the start and finish line as the bikes attempt the gruelling 37 ¾ mile Mountain Course. You’ll find the Island’s main shopping area in Douglas as well as a wide range of guest accommodation and the magnificent Gaiety Theatre and Villa Marina – both of which offer a year round programme of entertainment. Moving up the east coast you’ll find the picturesque village of Laxey which is set in a deep valley. Here you’ll be able to start your journey, either on foot or by rail, to the summit of the Island’s only mountain where you’ll be afforded views of the Seven Kingdoms on a clear day. Laxey also offers an insight into the Island’s mining heritage. It’s home to the world’s largest working waterwheel, Lady Isabella, which used to pump water to the mines, as well as the Laxey Mines Railway – parts of which are still in operation. Located just 7 miles from the islands capital Douglas lies the quiet picturesque village of Laxey. Laxey is set in a deep valley and is home to the famous Laxey Wheel which is the world’s largest working waterwheel. Lady Isabella, which was used to pump water to the mines as well as the Laxey Mines Railway of which parts are still in operation. WIthin the village itself you will find pubs, restaurants and local shops which stock all your needs. Laxey also have a small harbour and a beach which is a favourite with locals throughout the year. It can be accessed from all parts of the island through regular bus services which go through Laxey from Ramsey and Douglas, while the Electric tram runs from Douglas to Ramsey stopping at Laxey station. From Laxey you can also take the Mountain Electirc railway to the highest point on the island and the islands only Mountain called Sneafell which on a clear day you can see the 7 kingdoms (Scotland, Ireland, England, Wales, Mann, Neptune and Heaven), you can also use the Mountain railway to get to the mountain section of the TT course. Head north and you’ll find Ramsey, the second largest town on the Island, set against the magnificent backdrop of the North Barrule hills. 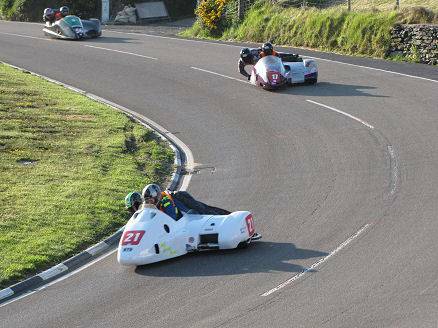 You can reach Ramsey by travelling along the world famous TT Mountain Course, which affords stunning views of the countryside and coast, or on the Manx Electric Railway where the line terminates. Ramsey boasts an impressive working harbour, masses of sand and shingle beach and one of the most impressive recreational spaces the Isle of Man offers. Set in 40 acres, Mooragh Park is a hotspot for visitors who will enjoy the sporting facilities, boating lake and children’s play areas. Curraghs Wildlife Park in nearby Ballaugh is also worth a visit. This well maintained park is home to a wide range of wildlife from across the globe, much of which is set in walk through enclosures giving you the chance to get up close to these magnificent creatures. If you’re looking for something to make your pulse race head to the Venture Centre in nearby Maughold where you can take part in a variety of exciting outdoor pursuits including kayaking, abseiling and coasteering. And if you’re looking for something more relaxing don’t miss Milntown or the Grove Museum. These well preserved period properties offer a fascinating insight into what life was like hundreds of years ago. Offering a variety of heritage attractions, glorious beaches and excellent walking trails, no trip to the Isle of Man is complete without a visit to the Beautiful South! Popular with visitors since the Victorian era, Port Erin sits within a beautiful secluded bay which offers a magnificent sweep of sheltered sandy beach – enjoyed by watersports enthusiasts and families. Boat trips to the Calf of Man’s nature reserve and bird observatory also leave from here. The town is also home to the most southern point on the Steam Railway line and has retained its original station as well as a comprehensive railway museum which showcases vintage transport memorabilia. You’ll find Port Erin a great place to start if you’re looking to explore the fantastic walking trails in the south of the Island – try weaving your way around the coastline to The Sound in Port St Mary. You’ll be greeted with stunning views out to sea as well as the opportunity to spot the seals which bask on the small rocky islet near to the Calf of Man. The busy harbour village of Port St Mary is home to the Island’s only nine hole golf course as well as Cregneash – a living museum which shows what life was like in the 19th Century Manx crofting community. No visit to the south is complete without a trip to the ancient capital of the Isle of Man –Castletown – which is dominated by the imposing Medieval fortress of Castle Rushen. The castle is one of the best preserved in Europe and was once dominated by the Kings and Lords of Mann. Located around the picturesque harbour you’ll also find the Old Grammar School, Nautical Museum, where you can learn about the Island’s maritime history, and Old House of Keys – the previous home of Manx parliament. Pay a visit to the aptly named “Sunset City” where you’ll be awarded stunning views of the sun setting, a glimpse of the Mountains of Mourne, and some of the best ice cream in the Isle of Man! Located on the west coast, Peel is a thriving Manx fishing port with a marine heritage that spans hundreds of years. Home to an extensive modern marina, the town welcomes a number of pleasure craft throughout the year – many of whom come for the fantastic sandy beach and variety of things to see and do. The magnificent ruins of Peel Castle, located on St Patrick’s Isle, dominate the landscape and visitors can tour the remains as part of the Story of Mann trail. There’s also the opportunity to find out more about the Island’s, and Peel’s, history by visiting the interactive House of Manannan museum, the Leece Museum and the unique Manx Transport Heritage Museum. During your visit you’ll also find the Island’s only cathedral as well as a working kipper curers which offers a fantastic insight into the production of the famous Manx Kipper. Between May and August Peel is also one of the best places in the British Isles to see basking sharks from the shore. Often up to the length of a bus in size they regularly come within metres of the shoreline and surrounding cliffs. Near to Peel you’ll find the pretty village of St Johns which is home to the Tynwald Millsshopping centre as well as Tynwald Hill which is an important landmark in Manx history and the location of an annual open air meeting for the Island’s parliament. Don’t forget to visit the secluded area of Niarbyl Bay, also on the west coast, which is one of the Island’s most important geological sites and offers fantastic walking trails. This entry was posted in Blog and tagged 59 club, ace cafe, cafe racer, guy martin, Honda, isle of man tt, Manx GP, norton, road racer, sidecar, ton up, tourist trophy, triumph.